Ben and Bobby | Servinio's Sports Etc. 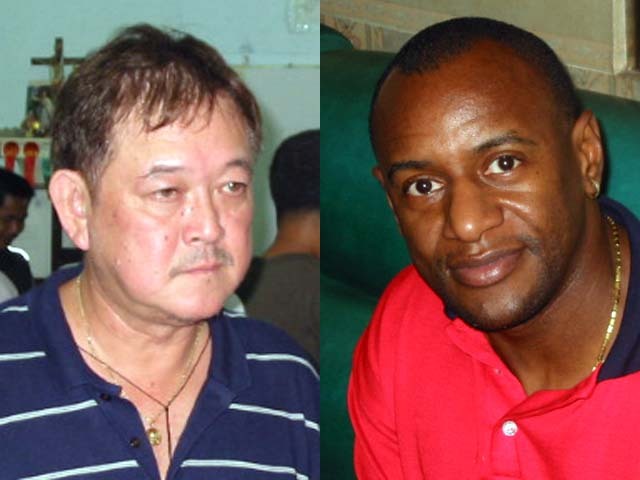 The Filipino basketball world recently lost two great men, Ben Solon and Bobby Parks. IT’S EASTER Sunday. While the whole of Christianity is celebrating the resurrection of Jesus Christ, the Filipino basketball community is grieving the loss of two gentlemen during the Holy Week who in their own way have made great contributions to the sport. On Holy Monday, Ruben “Ben” Solon, the amiable team owner of the Socsargen Marlins of the Metropolitan Basketball Association (MBA) bade farewell. He was definitely one of the friendliest executives during the professional league’s run from 1998 to 2002. Mr. Solon defied the odds and turned a ragtag team with limited resources into a contender, starting with the hiring of 15-year Philippine Basketball Association (PBA) veteran Melchor Ravanes as head coach. In the MBA’s inaugural season, the Marlins found a leader in Max Delantes, who came off a four-year hiatus from being a PBA role player to transform into a double-double machine in points and rebounds. Delantes was not the only one who was given a break by Mr. Solon and the Marlins. Teroy Albarillo was the only other PBA veteran on the roster but he and Delantes found a lot of help from youngsters like Mikko Santos and Cisco Pacheco from Saint Benilde and the Saint Francis trio of Malai Malabanan, Alwyn Flores and Orly Alvarado. Taking in players from small collegiate leagues was a big risk that indeed paid off. The team also enlisted UAAP stalwart and commercial league veteran Joel Gaspar from Far Eastern and young centers Christopher Corbin of UE and Chandler Donaldson of UST. Believe it or not, the Marlins were quartered right inside the Solon residence and were treated like ordinary members of the family. The team would hold their regular practices at the C. P. Tinga Memorial Hall in Taguig City and would travel to their home court in Koronadal City a few days before their games or for special occasions. The Marlins ceased operations after the 2001 season. After that, Mr. Solon returned full time to his business interests. As a neophyte journalist during the MBA days, Mr. Solon was a good subject to interview. He would also invite me a few times to his house for lunch or dinner with the players or any place after a game, win or lose. More gloom came on Black Saturday as seven-time PBA Best Import Bobby Parks lost his battle with cancer. Parks will always be remembered as the yardstick for how foreign reinforcements should behave and perform on and off the basketball court. The last time I had a lengthy chat with Parks was during the launch of the San Miguel Beermen for the ASEAN Basketball League in 2011 were he was the head coach. I guess that Memphis-style barbecue we discussed in parting will never come. Coaching the Beermen was a homecoming for Parks, the first team that hired him to play in the Philippines, powering them to the 1987 PBA Reinforced Conference. The final tweet on his Twitter account posted last January 11 said “Lets go beerman”. Watching as a fan during his PBA days, I got to interact more when he assumed the head coaching job at Spring Cooking Oil of the National Basketball League (NBL) in 2003. The year earlier, the then 40-year old former Memphis Tiger reinforced Spring at the FIBA-Asia Champions Cup together with future PBA import Geremy Robinson. Statistics alone speak volumes of Parks’ PBA legacy. His career averages of 40.5 points and 15.3 rebounds over 221 games in 13 seasons will be hard to surpass. Prospective imports can learn a lot from his example. Parks was a true gentleman who showed respect to the game – he never complained or retaliated despite all the dirty attacks on him by opponents and just let his game do the talking. The key here is that Parks embraced the local culture to the point he decided to settle down and raise a family. Another indicator of his love for the Philippines was the fact was always ready to act as import in international competitions, including four FIBA-Asia Champions Cups stints. Despite his celebrity status, Parks managed to keep a low profile keeping his private life private and never allowing it to mix into basketball matters. No wonder he lasted 13 seasons as a player and more as a coach, consultant or import in the PBA and other Filipino leagues. With both Boss Ben and Coach Bobby gone, we can only go back and reflect on the great lives they lived. Their legacy will now be passed on to their sons – Steve Solon is the current Vice-Governor of Sarangani province and is running unopposed for Governor this May while Bobby Parks Jr. is the star player of the National University Bulldogs and reigning UAAP Most Valuable Player. Thank you Boss Ben and Coach Bobby! This entry was posted in Basketball, MBA/Metroball, PBA, Sports, UAAP. Bookmark the permalink. I had the privilege to know and work for the Chiongbian-Solon family and what you said about Mr. Ben Solon is true. Actually, the entire family is just like him, amiable, low key, warm, kind, generous, compassionate, dedicated. My condolences to Ma’am Lucille, Steve and family, Pring and Andrew, Tom Jim, Kenneth and Samantha.